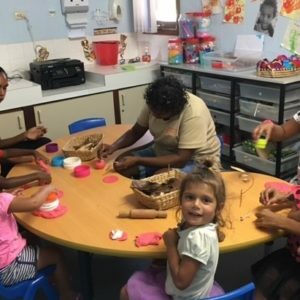 In 2011, Gumala Aboriginal Corporation developed a unique Early Childhood centre and learning program at our remote community at Wakuthuni, thanks to an innovative partnership with the University of Melbourne and Tom Price Primary School. The initiative involved the design and construction of an early education centre at Wakuthuni, as well as an early childhood education and care program (the 3a Project). Many of the permanent residents living at Wakuthuni, which is located between Tom Price and Paraburdoo, are Gumala Members. This initiative breaks new ground in the systematic development of evidence-based, sustainable education as part of a broad community building exercise. In 2012, the 3a (Abecedarian Approach Australia) Project was given official endorsement via a partnership agreement by WA Education Minister Peter Collier. The Abecedarian Approach Australia (3a) is a collection of teaching and learning strategies, and has been developed by world-renowned academic Professor Joseph Sparling and his associates. Since 2011, the 3a Project has expanded across the Pilbara and Gumala now has 3a Centres in many towns and remote communities in the north-west including Wakuthuni, Karratha, Marble Bar, Warralong, Roebourne and South Hedland. The 3a Project uses learning strategies which incorporate educational games, conversational reading and enriched care giving. The approach also assists parents through education on appropriate care giving and learning activities for their children. The program receives funding from Department of Prime Minister and Cabinet through the IAS funding, and also the Department of Social Services. 3a-related research over 30 years has found that the 3a approach has been associated with health benefits such as lower levels of cholesterol, hypertension and obesity compared to children that have not been exposed to the program. The parents and caregivers involved in 3a have become respected role models in remote communities. The 3a curriculum has been associated with positive long-term social and community orientated behaviours.